A South African sculptor behind the construction of former president late Bingu wa Mutharika's statue who faced criticism has defended his work, saying that what she has made is a true reflection of the late president based on photographic information and approvals from government delegation and members of the family who supervised the works. A memorial service followed soon after the unveiling ceremony of Bingu statue erected at the Parliament Building in Lilongwe. Social media users have been querying the photos of the statue, saying it does not fully reflect what Bingu looked like. The internet memes followed almost immediately the statue photos were circulating on social media. But the sculptor, Jean Doyle said both the government delegation and members of the Mutharika family supervised his works in South Africa and gave their stamp of approval as the project progressed. "They gave it the go-ahead. They liked what they saw," said the sculptor in an interview with Nyasa Times. The artist, who also constructed the statue of president Hastings Kamuzu Banda erected at Area 18 Memorial Tower in Lilongwe, said she is proud of what she has constructed. 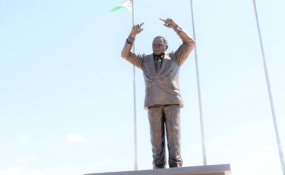 After the unveiling of the statue by President Arthur Peter Mutharika in Lilongwe on Friday, many critics said the clear picture on the statue now looks a fair reflection of the country's former leader. Bingu's statue is clearly depicting him with his signature gesture to the country that "let the works of my hands speak for me." The statue unveiling also marked seven years since the death of the former president. Through his first term, from 2004 to 2009, the works of his hands spoke of great political and economic success. All of a sudden, things changed in 2011 during the second year of his second term. - the usual final term curse for African leaders when the works of his hands spoke more of struggle than success. Sources within government estimate that the statue will cost taxpayers in excess of K120 million, including travel expenses for government officials and family members who have been supervising the work.